Beers Made By Walking invites brewers to go on nature hikes and make new beers that are inspired by plants from the trail. Each beer is a unique, drinkable portrait of the landscape. 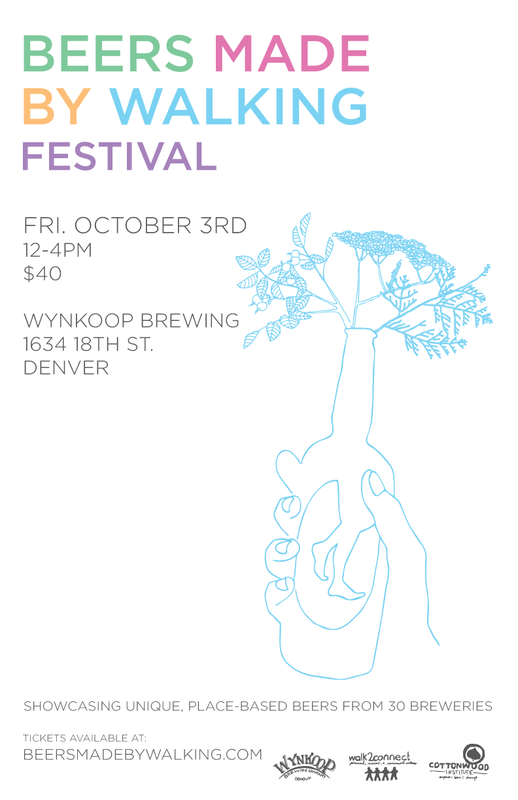 We are excited to announce our annual festival at Wynkoop Brewing in Denver on Friday, October 3rd, from 12-4pm MST. Now in it’s fourth year, the event showcases over 30 place-based beers to the countless beer lovers that have gathered in Denver for the Great American Beer Festival. Over twenty of the beers were made specifically for this event from Colorado breweries that have collaborated with us. Each beer is inspired by landscapes in an area of the brewer’s choosing. Brewers have hiked up 14,000 foot mountains, trekked through lush canyons, camped in national parks, and strolled through community gardens to find inspiration. Additionally we will serve a series of beers that fit into the Indigenous Style Category from breweries around the country. See sneak peeks of the beers here. Tickets go on sale here, on 9/3 at noon MST. Visitors will receive special glassware for the event, and unlimited access to the beers, until they run out. We are happy to announce that half of the proceeds will once again be donated to the Cottonwood Institute in Denver, a non-profit organization that inspires young people to initiate positive change by strengthening their civic engagement, environmental stewardship, and leadership skills. Sponsors: This event is generously sponsored by Walk2Connect and Wynkoop Brewing. We took wort from our Independence Pass Ale mash and reworked our hops additions to use wild hops from the Rio Grande Trail in Aspen. An ode to the high desert, sagebrush and juniper flavor reign supreme supported by a malty backbone. This beer is inspired by the Boneyard mountain biking trail in Eagle. This beer features dried elderberries, yarrow flower, prickly pear syrup and home grown hops. We chose these ingredients because these plants were seen on our hike at the National Center for Atmospheric Research. A wet hopped Belgian Double IPA aged on wild raspberries gathered along Montgomery Reservoir. A Gose, old-German style wheat beer with salt and lactic acid, turned deep purple from the addition of chokecherry. This beer is inspired by a hike to Grey Rock in Roosevelt National Forest. Chocolate Stout made with Hershey's syrup and Horehound, a plant from the mint family found in Colorado. This beer is inspired by a hike on Mt. Galbraith in Golden, CO. Brewed with Pale Ale wort, with fir needles instead of flavoring and aroma hops. The beer is inspired by a hike along West Lake Creek Road in Edwards, CO. Pale Ale with wild Porcini Mushrooms added post-fermentation, inspired by a hike at Marshall Pass and Waterdogs Lake. The same great honey-wheat beer we brought to BMBW last year, inspired by a hike in Boulder's Chautauqua Park. It has been aged with Brettanomyces in oak for a full year. Inspired by a stroll in Platte Park, we added peaches, lavender, and our house yeast "Johnny Appleseed,” which was propagated from a neighborhood apple tree. The beer was aged in a sherry cask. Saison brewed with organic sage and horehound based on a hike in Red Rock Canyon. A big, bold Northwest Imperial IPA with spruce tips that round out the piney hop character and elderflowers which impart a subtle floral accent based off a hike in Discover Park in Seattle, Washington. Amber ale with gin-like characteristics from Juniper and Cedar, inspired by a walk at The Gardens at Spring Creek in Fort Collins, CO as well as other perambulations around the state. This BMBW Stout has a spruce almost maple flavor derived from spruce tips I (brewer Johnny Benson) cut from my Family property near Horsetooth Reservoir in northern Colorado. Inspired by a hike on Rabbit Mountain, Pollen Buzz is a honey lager made with orange blossom honey and Tettnang hops. Brown ale, sour mash, with our house Brett strain and souring bacterias. Raspberries were added during secondary fermentation. The beer was inspired by a hike in the Pike National Forest, near Signal Butte. Creamy milk stout enhanced by mountain sage and juniper berries inspired by a hike to Horsetooth Falls. Colonial style ale brewed with the new growth from Spruce trees, inspired by trails in the surrounding San Juan Mountains. Cream Ale brewed with Colorado grown and malted barley, Colorado grown hops, prickly pear and yarrow, inspired by a 3 mile walk from the brewery to Bluff Lake Nature Center in Denver. Cream Ale finished on chokecherries that were harvested off-trail on South Table Mesa overlooking the Coors Brewery in Golden, CO.
Crafted in the spirit of wild harvest. Featuring a feral brettanomyces strain, aged on rhubarb and wild Colorado chokecherries, this beer was inspired by a hike in Cheyenne Canon, Colorado Springs. Inspired by native ingredients found on the Catamount Trail in Green Mountain Falls, CO. We used amaranth, mustard seed, rose hips and lemongrass in this Saison. A pale beer fermented in white wine barrels with two wild yeast strains cultured from the skins of fruit. The beer was aged on Palisade peaches and sage. This beer was inspired by a hike to Hanging Lake. We hiked along South Boulder Creek which flooded last year leaving behind a lot of uprooted trees and debris along the creek. The heavy moisture last year set up an abundance of fruit, including chokecherry. Inspired by a walk in the Boulder foothills, we roasted both Chicory and Burdock roots and added them to both the boil and secondary fermentation. A fashionably anarchic take on an English Pale Ale, this beer was inspired by a walk in the Pike National Forest. It is brewed with sagebrush, thyme, lavender, anise hyssop and wild bergamot for aroma and bitterness. Falling somewhere between a Belgian blond and a saison, Killer Rabbit comes from a walk along our neighboring South Platte River Trail where an abundance of Rabbitbrush lines the trail. Lightly smoked milk stout aged on American oak. Salted Sunflower Saison brewed with local barley, wheat and rye from Riverbend Malt House of Asheville, North Carolina and sunflowers from Bluebird farm of Morganton, North Carolina. An earthy and spicy saison brewed with foraged stinging nettle from the NC mountains and Santiam hops. 5% ABV. Hoppy Belgian Ale brewed with Belma and Jarrylo hops and North Carolina paw paw fruit. Our first foraged beer and a Fullsteam tradition, we brew this Belgian Winter Warmer with foraged native persimmon (Diospyros Virginiana) and farmed Fuyu and Hachiya persimmons. A food-friendly, balanced Gose with six indigenous ingredients from the mountains to the sea: North Carolina spruce pine, hops, wheat, barley, coriander, and Outer Banks sea salt. Golden Farmhouse ale with local wildflower honey from Bennett’s Honey Farm, Fillmore, CA, and locally-grown Sauvignon Blanc grapes & aged in a barrel from Semler’s Malibu Family Wines' Estate. Saison brewed with 105 different plants and fungi found around our property. Milk stout brewed with black trumpet mushrooms. Amber ale brewed with wild carrot seed (a.k.a. Queen Anne's Lace) root and seeds. Saison brewed with dried sassafras leaves. Saison brewed with Cascade hops from our property and sumac found 6 miles from our brewery. A collaboration with Fonta Flora Brewing. Inspired by visits to local farms, it was fermented with Saison yeast and Brettanomyces and transferred onto 75 lbs of fresh, local Rhubarb.